When Alma visited the city of Gideon, he was pleased to find the people there were living righteously (Alma 7:5–6, 17–20). Because of their righteousness, Alma was permitted to share with them important truths about the Savior’s atoning sacrifice that he had not shared in Zarahemla. B and this that the word might be fulfilled which saith he will take upon him the pains and the sicknesses of his people. The center is typically the most important part of a chiasm, thus this pattern places emphasis on the fact that the Savior would suffer all of this “according to the flesh.” Alma described the Atonement in intensely physical terms. His comprehensive list of things Christ would take upon himself is comprised largely of physical suffering: pains, sicknesses, infirmities, and death. But Alma also included the crucial, spiritual forms of suffering: temptations, sins, and transgressions. 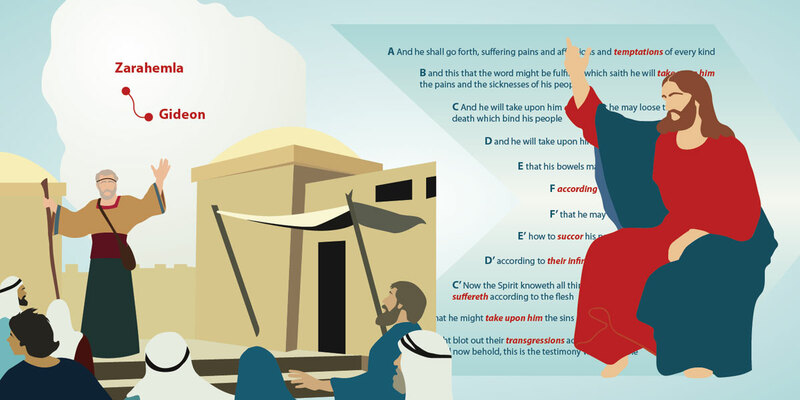 Alma’s understanding of Christ’s atoning sacrifice was based both on his reading of scripture (specifically Isaiah) and personal knowledge revealed by the Holy Spirit (Alma 7:9, 26). This sets an example for readers today, who can likewise learn eternal truths through both scripture study and personal revelation. Alma’s inspired choice to only share this information with those whom he sensed by the Spirit were better spiritually prepared also teaches an important principle: “Give not that which is holy unto the dogs, neither cast ye your pearls before swine” (Matthew 7:6). The Savior has suffered not just for our sins and iniquities—but also for our physical pains and anguish, our weaknesses and shortcomings, our fears and frustrations, our disappointments and discouragement, our regrets and remorse, our despair and desperation, the injustices and inequities we experience, and the emotional distresses that beset us. Elder Dallin H. Oaks, “Strengthened by the Atonement of Jesus Christ,” Ensign, November 2015, 61–64. Elder David A. Bednar, “Bear Up Their Burdens with Ease,” Ensign, May 2014, 87–90. 1. Some have criticized the Book of Mormon because it says that Christ would be born “at Jerusalem, the land of forefathers” (Alma 7:10). For responses to this, see Hugh Nibley, Lehi in the Desert/The World of the Jaredites/There Were Jaredites, The Collected Works of Hugh Nibley, Volume 5 (Salt Lake City and Provo, UT: Deseret Book and FARMS, 1988), 6–7; Hugh Nibley, An Approach to the Book of Mormon, The Collected Works of Hugh Nibley, Volume 6 (Salt Lake City and Provo, UT: Deseret Book and FARMS, 1988), 100–102; Robert F. Smith, “The Land of Jerusalem: Place of Jesus’s Birth,” in Reexploring the Book of Mormon: A Decade of New Research, ed. John W. Welch (Salt Lake City and Provo, UT: Deseret Book and FARMS, 1992), 170–172; Gordon C. Thomasson, “Revisiting the Land of Jerusalem,” in Pressing Forward with the Book of Mormon: The FARMS Updates of the 1990s, ed. John W. Welch and Melvin J. Thorne (Salt Lake City and Provo, UT), 139–141; Daniel C. Peterson, Matthew Roper, and William J. Hamblin, “On Alma 7:10 and the Birth Place of Christ,” (FARMS Transcripts, 1995); Daniel C. Peterson, “Chattanooga Cheapshot, or the Gall of Bitterness,” Review of Books on the Book of Mormon 5, no. 1 (1993): 62–78. 2. See Thomas A. Wayment, “The Hebrew Text of Alma 7:11,” Journal of Book of Mormon Studies 14, no. 1 (2005): 98–103, 130. See also Monte S. Nyman, Book of Mormon Commentary, 6 vols. (Orem, UT: Granite Publishing, 2003), 3:90. Brant A. Gardner, Second Witness: Analytical and Contextual Commentary on the Book of Mormon, 6 vols. (Salt Lake City, UT: Greg Kofford Books, 2007), 4:129 probably meant to refer to Isaiah 53, but instead said Isaiah 14, seemingly confusing it with Mosiah 14, which is the chapter where Abinadi quotes Isaiah 53. 3. Adapted from Donald W. Parry, Poetic Parallelisms in the Book of Mormon: The Complete Text Reformatted (Provo, UT: Neal A. Maxwell Institute for Religious Scholarship, 2007), 241. 4. Nyman, Book of Mormon Commentary, 3:85, 90–91; Joseph Fielding McConkie and Robert L. Millet, Doctrinal Commentary on the Book of Mormon, 4 vol. (Salt Lake City, UT: Deseret Book, 1987–1992), 3:57. 5. Elder Dallin H. Oaks, “Strengthened by the Atonement of Jesus Christ,” Ensign, November 2015, 64. 6. Elder David A. Bednar, “Bear Up Their Burdens with Ease,” Ensign, May 2014, 89–90.